Canine OCD (Osteochondritis Dissecans) is a cartilage problem. Specifically, part of the smooth cartilage is damaged or grows abnormally. OCD affects mostly large breed dogs. This page looks at the symptoms, causes, and treatment of OCD in dogs. Osteochondritis dissecans, commonly known as OCD in dogs, is a problem or disease of the cartilage as it develops. In growing puppies, much of the bones are actually made up of cartilage. As the puppy grows, the rapidly-growing cartilage at the ends of bones becomes calcified and gradually turns into true bone. That is how bones lengthen. At the ends of the bone (joint surfaces), a thin layer of cartilage remains. This allows joints to move and glide smoothly, without much friction and of course without pain. If this layer of smooth cartilage surface is somehow damaged, friction will occur and any joint movement will become painful. In canine OCD, this is exactly what happens. Part of the smooth cartilage is damaged or grows abnormally. In most cases, the cartilage cracks or separates from the bone which the cartilage is supposed to cover and protect. As a result, the cartilage forms a loose “flap”, with parts of it still attaching to the bone underneath and other parts torn apart. Sometimes, an entire piece may break into loose fragments. These are known as “joint mice”. OCD is common among rapidly-growing large and giant breed puppies. But several large breed dogs have decreased incidences of canine OCD. 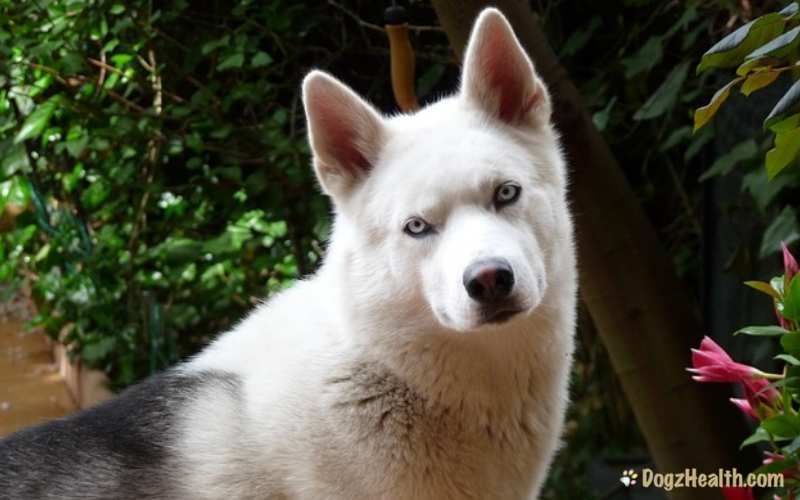 The lucky ones include Doberman Pinscher, Collie, and Siberian Husky. OCD affects male dogs more frequently than females. The first signs show up between 4 and 8 months of age, although it can also show up in older dogs. 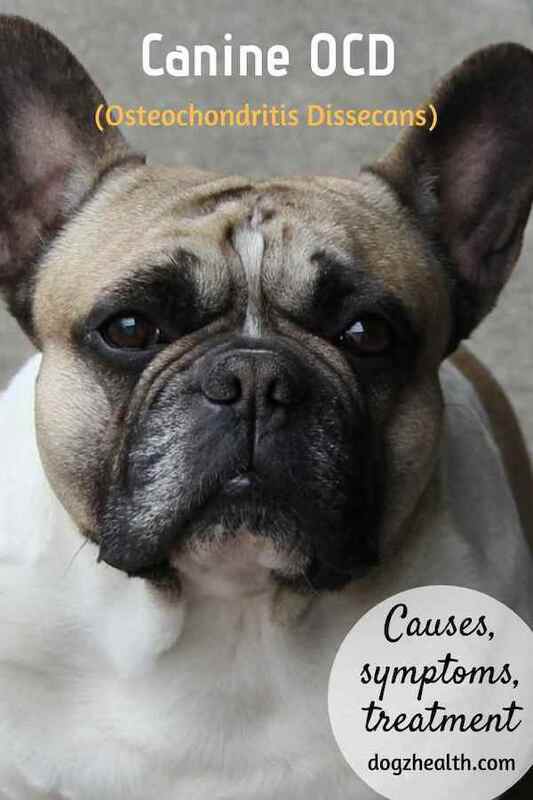 Poor genetics is the most common cause of developmental joint problems in dogs, such as canine OCD. It appears that some genetic flaws in certain breeds lead to the formation of this disease. Therefore, careful screening of parents against OCD in dogs is necessary during the selection of all breeding dogs. Improper nutrition could increase the severity of joint problems in dogs, such as hip dysplasia and OCD. While improper nutrition, e.g. a diet that creates rapid growth, by itself may not cause OCD, it may make the disease worse. While exercise will not cause OCD in dogs, the type and amount of exercise can worsen the signs and even speed up the disease process. If a puppy has a joint disease such as OCD, too much or too vigorous exercise can aggravate the signs. Trauma, whether chronic or acute, may contribute to the formation of OCD in dogs. Injury to the surface cartilage may lead to the separation of the cartilage from the bone. It may also cause a decrease in blood supply that leads to cartilage flap formation. OCD can affect several joints such as the shoulder, elbow, knee or hock. But the head of the humerus in the shoulder joint is most commonly affected. Another joint that is rather commonly affected is the elbow, where many of the defects of elbow dysplasia are caused. OCD occurs less commonly in the knee or hock joints. The classic symptom of OCD in dogs is lameness in the affected limb. The lameness tends to get worse with exercise and improves after rest. Symptoms may appear after strenuous use of the limbs, such as jumping down stairs. The dog will feel pain on flexing and extending the joint. When OCD occurs in the shoulder, you may notice a shortened fore-limb stride. This is because the dog doesn’t want to flex and extend the shoulder joint due to pain. A vet may suspect OCD when he fully flexes and extends a dog’s limb and the dog shows pain. The dog may become aggressive and resist any manipulation of the affected joint. The dog may cry out in pain when the vet tries to touch the joint. If the vet suspects OCD, he will use x-rays for a definitive diagnosis. The x-rays may show fragmentation of joint cartilage or a loose piece of cartilage in the affected joint. Treatment of OCD in dogs includes the use of pain killers (such as NSAIDs like Rimadyl) and supplements (such as glucosamine and chondroitin sulfate). Some vets may suggest an injectable supplement called Adequan, which is injected directly into the affected joint. 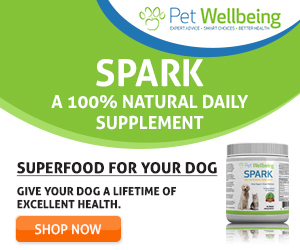 This supplement, like glucosamine, contains polysulfated glycosaminoglycans (PSGAG) derived from bovine tracheal cartilage and has anti-inflammatory properties. In addition, a dog with OCD may need to have strict rest for 4 to 8 weeks. He may do mild exercise like leash walking but definitely no running or playing. In many cases, dogs with OCD need surgery so that the vet can scrape away defective cartilage and remove any joint mice. Surgery can produce the best results in the shoulder and elbow joints, and less favorable results in the hock and knee joints. In the hock and knee joints, degenerative joint disease is likely to occur over time as a result.